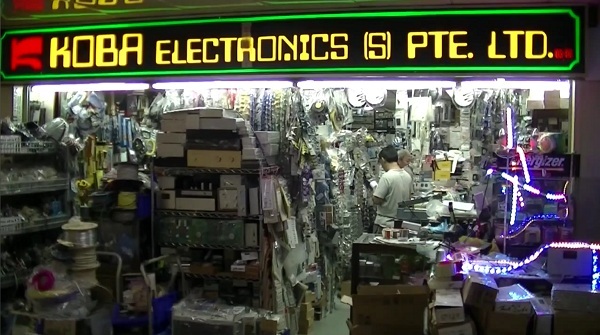 Visit the major electronics shops in Singapore, and get a guided tour of the Singapore hackerspace. This weekend we were in Singapore for the Maker Faire, so we took a day to do a geek tour. This kicks off the second season of our Global Geek Tours. We’re super excited about this episode. Kelvin arranged interviews and permission to film, we didn’t get kicked out of a single shop! We even talked to someone about the deal with all the LED shops in Asia! We hope the audio and everything else is better than ever. A huge thanks to Kelvin, Darell, Tong Wei, and everyone at the Singapore hackerspace for making it a killer tour! This is the complete and final video, if you watched yesterdays preview you can skip to 4:33 min mark for the new stuff. Read a summary of our Singapore visit below. Our visit starts at the charming Koba Electronics located in Singapore’s China town. It’s tightly packed with all kinds of electronics stuff. We liked the way the stuff was displayed in strips of plastic bags hanging everywhere. Whole walls are filled with different LCDs, speakers, and rubber belts for mechanical projects. Switches and knobs hang right there in your face, free for you to pick up and evaluate for your project. Kelvin took us there because it’s his favorite shop. He says there’s always a surprise on every visit. 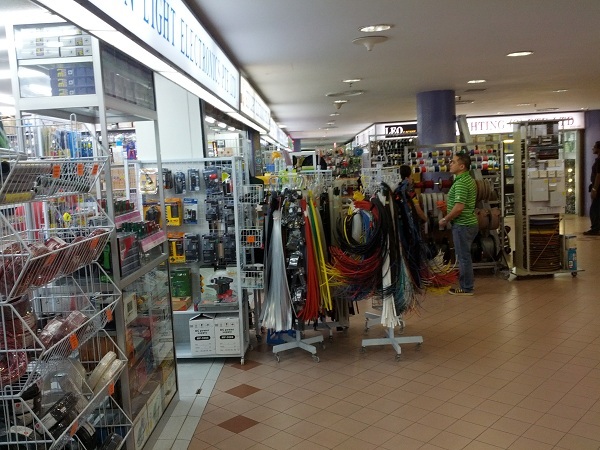 Check out another review of the Koba Electronics store by a fellow hacker. Our second stop was Sim Lim Tower, a well known electronics stop. It’s a multilevel building with loads of electronics shops on every level. We found stores dedicated to service manuals, featuring schematics and repair manuals for consumer electronics. It also has stores with general electronics parts like motors, connectors, knobs, and buttons. In our previous Global Geek Tours we noted a cornucopia of LED shops all over major Asian cities. In Singapore we finally find out who buys all these LEDs. 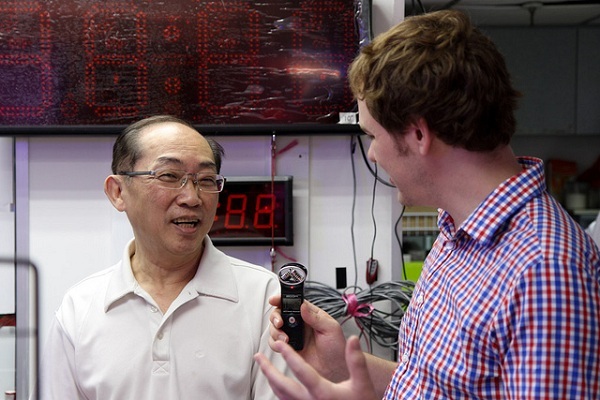 In Sim Lim Tower we got to interview T.J. Khoo, an LED shop owner. The LED shop used to be a general electronics shop for students and hobbyists. They recently specialized in LED products because they sell like hotcakes. Their largest customers are local companies, individuals, and creators of temporary installations like advertizing displays. Students and hobbyists are still welcome of course. In this store we also found small strips of addressable LEDs, giving you the opportunity to sample them before investing into an entire roll. We visited a PCB fab office in Sim Lim Tower. They are a lot more expensive then cheap PCB services like Seeed, or ITead, up to $150 SIN ($120 USD) per board. If you live locally and need fast turn-around, this is could be an option. 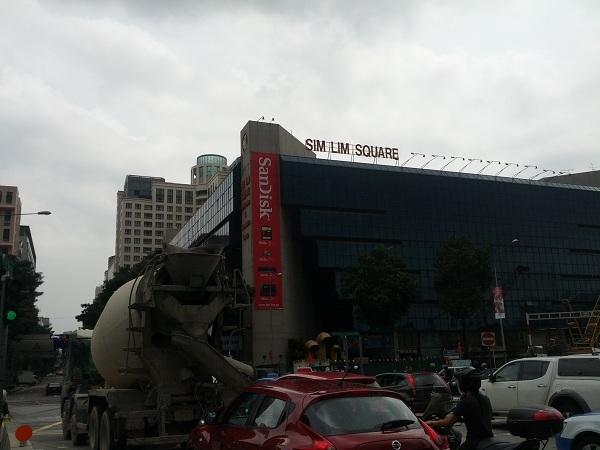 Next stop on our tour is the Sim Lim Square, right across the street from Sim Lim Tower. This is a mall with mostly consumer electronics and computer hardware shops. While not many electronics shops are to be found in Sim Lim Square, there’s literally anything you’d need for a DIY computer build. Prices are reasonable, we paid about $17USD for a 16GB Sandisk 10x SD card. In the back allies and wings of the ‘Square we did find some electronics shops. One had all kinds of connectors and adapters for RF stuff. Fail alert! For some reason throughout the tour Ian called this Sim Lim Plaza. Mad Skillz our producer must have been occupied and didn’t catch it. It gave us a sad in the editing room. In the evening we went to the Singapore hackerspace. They have a main area where people just chill out with laptops and have nightly group meet-ups. 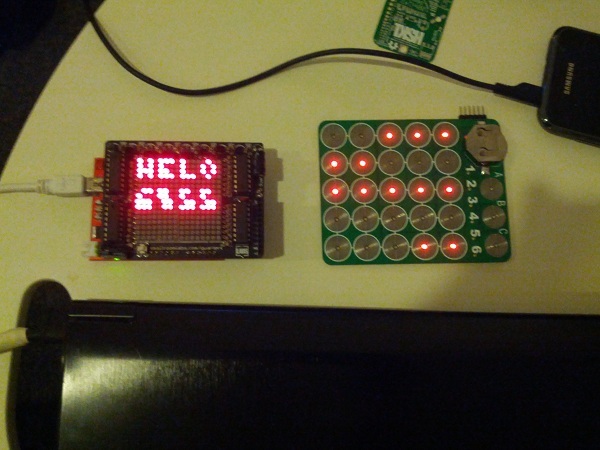 At the hackerspace we talked to Mats (blog reader and forum member) about some of his projects. He showed us a touch screen button board with LEDs mounted upside down on the back. They shine through vias to light up the touch buttons. Mats also brought an Arduino shield with 4 8×8 LED matrices mounted on it, giving you a nice 16×16 Arduino-controlled LED matrix. Hot tip: the matrix is about a buck on eBay, but only 10 cents on Taobao. 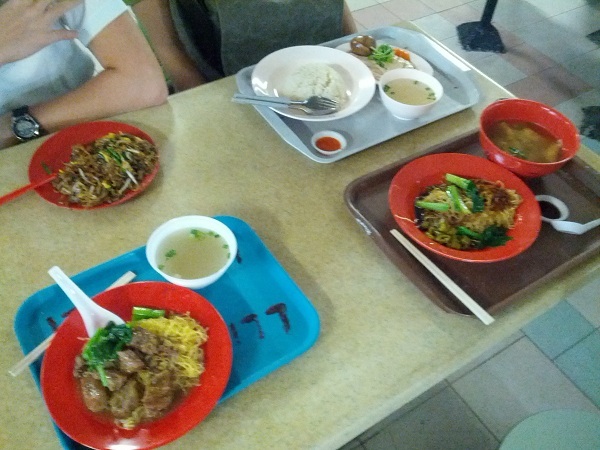 One of the best things about our tour of Singapore was the amazing food. The street food is wonderful, and the hawker stalls are cheap, warm, and fresh. We didn’t eat a single bad thing the entire time. We had a great time in Singapore. From the parts, and components in Sim Lim Tower, to the computers, and gadgets in Sim Lim Square. And of course our favorite, the cozy, and crowded Koba electronics shop in Chinatown. A huge thanks to Kelvin and Singapore Hackerspace for being fantastic hosts. Remember you can grab our Google Map and visit all these places yourself. Follow us on Twitter to see live updates from out next Global Geek Tour, and stay tuned to the blog for more pictures and giveaways from this trip. Next week’s video will feature a complete coverage of Singapore’s Maker Faire. Then we have a special treat. Later this year the Global Geek Tour will take us to New York; Mumbai, Bangalore, and Cochin, India; and of course Tokyo. Early next year we’ll be exploring the electronics scene in Thailand. If you have suggestions for any of these locations, or know of other markets we should visit, please hit us up over the contact form. This entry was posted on Friday, August 10th, 2012 at 3:55 pm	and is filed under Global Geek, Hackerspace, Videos. You can follow any responses to this entry through the RSS 2.0 feed. You can skip to the end and leave a response. Pinging is currently not allowed. Great tour video guys, and the end is just precious! OK, I started planning the next tour. We’ll have to go to Akihabara a few days, I learned a few interesting places too (not maid cafes, no more maid cafes! :P ). Can’t wait to do a tour of new Tokyo hacker space. I am also excited Bout next time. Wish there was a date so I could clear the calendar and buy tickets. Yoshi has friends with shops we can meet next time, and I will work on arranging interviews for sure. It was so easy this time with the meetings Kelvin set up for us. Main worry is what is season 3? Jakarta, Mexico or south america, and??? Another part of china probably. Shanghai or beijing. Tour will be real short, the new space is waaaay smaller, but we got a separate place for welder and smoker! A bit far but those things don’t get used all the time. Turkey? :D In Istanbul, there are 2 places I know, on different sides of Bosphorus, European side one is bigger. Have to check it out myself though. + 2 of my friends opened 2 different hackerspaces there, I’ll visit them and give a talk about hackerspace culture when I go back for a holiday. I know there is a monthly market in Poland that could be easy and fun. Mad skillz also suggests electronics recycling in Africa. That might be a stretch. Maybe season 4.
very nice job, and especially the audio is quite clear. Did you have a wireless or wired connection to your camera, or was this strictly 2nd-system sound and you had to manually line up the audio track separately on each clip in the edit? Or maybe you have good enough time stamp synch so the NLE can auto-place the sound clips? The sound is a total second system with no camera sync. I was counting on timestamps, but there were some issues this time. I’ll experiment more in the coming workshop videos. At 03:00: sign Tantarum caps, not Tantalum. Ian at 01:05 says, “arm comes up so you can pop your DIP Chick in”, he he. It’s the humidity in Singapore that gets to you as much as, if not more than the heat. The place is literally built on top of a swamp. You should try it when the haze blows in from Sumatra and Kalimantan in Indonesia where they are slashing and burning all the forests. Heat, humidity, and choking-burning smoke – yech. You need a space suit to get around outside. Yo, nice video, bro! You mention going to “your local shop” and “brick and mortar stores,” and as a former employee of such a store, I’m wondering what kind of experiences you’ve had at local electronic stores. Maybe give your local store a shoutout or something and let us know what you look for in local electronic stores. Who knows, you might just be able to get some local electronic stores near you some more business! Great idea. We’ll share ours, but I’d be really interested to see pictures of electronics shops all over. Maybe a giveaway of some kind. As per my email I followed your steps through the video above in Nov 2012 and had a great time. It was a weekend so plenty was closed but plenty was open and thriving too. Recommend people go during the week if they can. 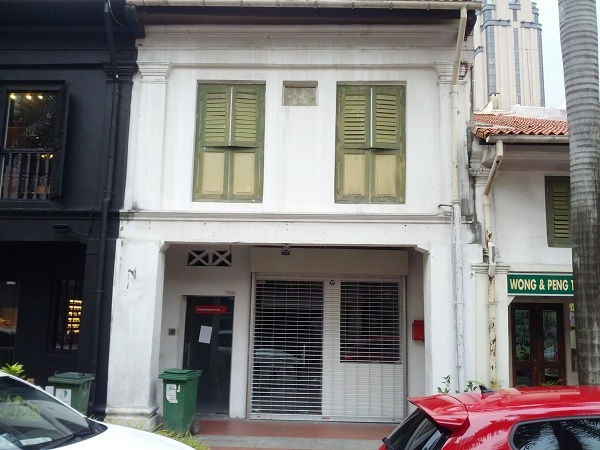 Don’t expect cheap prices, most things in Singapore are priced on par with Nth America, but do expect lots of variety and some history lessons.